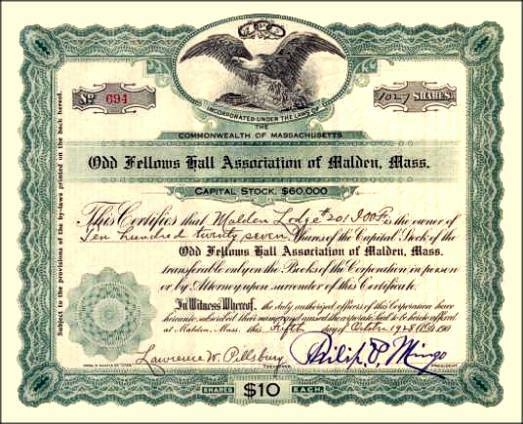 Beautifully engraved certificate from the Odd Fellows Hall Association of Malden, Massachusettes issued no later than 1928. 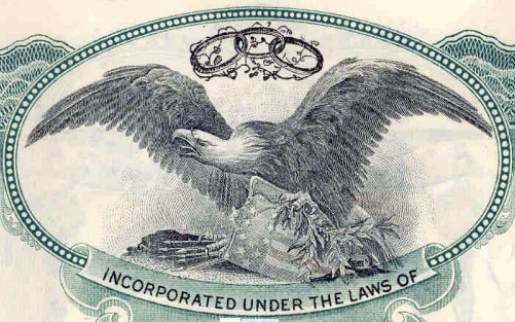 This historic document was printed by the Hobbs & Warren Company and has an ornate border around it with a vignette of an eagle the Odd Fellow's logo representing the "Three Link Fraternity". This item is hand signed by the Company's President and Secretary and is over 75 years old. The Odd Fellows Hall in Malden, Massachusettes was built in 1907. It is an example of 20th century formal eclectic design combining Renaissance and Classical Revival elements. It has been restored into a professional office building. Architect, builder, or engineer: Newhall,Louis C.